Not to be confused with Haunted House in Masteria. The Haunted House is an event area accessible only during Halloween. The Haunted House can be reached by double clicking the party invitation in the "Use" inventory, which can be obtained from Cassandra for the duration of the event. This small one-map town has only two NPCs, Gatekeeper and A Strange Cat. To enter the mansion itself, players must accept a quest(repeatable every 5 minutes) from the cat, go out to the Graveyard nearby, and remember the names on the tombstones. Simply enter the names in the Strange Cat's quest dialog to transform into a ghost, and enter the building. To re-enter after leaving, this quest can be skipped by wearing either a Pumpkin head mask or the Masked Gentleman's hat, both available from the maid party quest and uninvited guest party quest respectively in the mansion, or transforming into a ghost by using a ghost sweet, obtained by exchanging a halloween candy for a ghost sweet from the Trick or Treat quest, available in all towns. The only map outside the Mansion. It's a graveyard which contains 4 tombstone NPCs, each with a name written on it. These names are important to enter the house. The Prendergast Mansion was once a great center of production for the Prendergast Toy Company. Jonas Prendergast, the owner of the company, never sold very well... Until his assistant Peto made the perfect doll. Sales skyrocketed, and things were great, until Jonas took all the credit and cast Peto out. Once Peto was gone, he tried to eliminate all evidence of Peto's influence, including his daughter's, Sophelia's, favorite doll. Sophelia would not play with any of the dolls Jonas made, and only wished for Peto's doll back. Jonas, desperately trying to create a doll that would make Sophelia happy, locked himself in his workshop and worked nonstop. A hundred years later, the Masked Gentleman, a mysterious character, began holding parties in the supposedly Haunted Mansion. He has a number of party games, such as pumpkin carving, and the Uninvited Guest Party Quest. The Masked Gentleman also possesses extraordinary powers, allowing his guests to experience the tale of the Mansion's original owners. 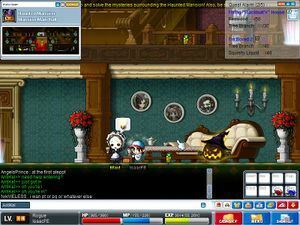 This version of the Mansion is only available in KoreaMS, ChinaMS, JapanMS and has retired in MapleSEA. 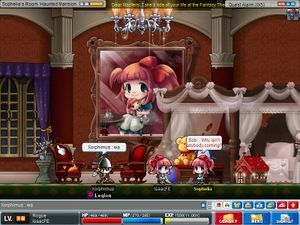 This version of the Mansion is not required in GlobalMS or EuropeMS due to the existence of the permanent Haunted House in Masteria. This page was last edited on 5 November 2013, at 19:59.